Not everyone is into bright and cheerful tacky Christmas sweaters. If you prefer gothic wear, then take a look at these Sourpuss tacky goth Christmas sweaters and accessories. 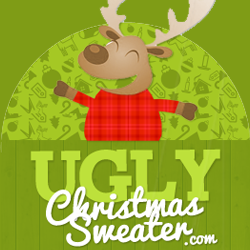 Their “Sleigh Me” and “Gingerdread” designs are in the traditional ugly Christmas sweater pattern with some non-traditional motifs, or you could say traditional motifs with a twist. You can find cardigans and hoodies in these styles and they also have other Christmas-themed sweaters and accessories. Several of these items come in more than one color. Sourpuss Clothing offers an alternative to standard Christmas fare, with humorous, slightly off-color clothing. Featuring some unique twists on holiday themes, these items are great for non-conformists. They carry men’s, women’s, toddler and infant sizes in many of their products. If you like Sourpuss’ Clothing Christmas sweaters, you will love these rock n’ roll and alternative-themed tops. In several styles for adults and children, Sourpuss Clothing will keep your friends on the ball. Click through any of these links for descriptions, measurements and color choices. For your gothic-themed Christmas party, these invitations are a great place to start. Personalized these invitations for your gathering or click through for more options. You can find gothic Christmas party supplies on Zazzle that you can personalize for your own unique touch.